The Zaku I as used by Denim and Slender from the animated adaptation of Gundam The Origin! Kit comes with parts to build either pilot's personalized machines. 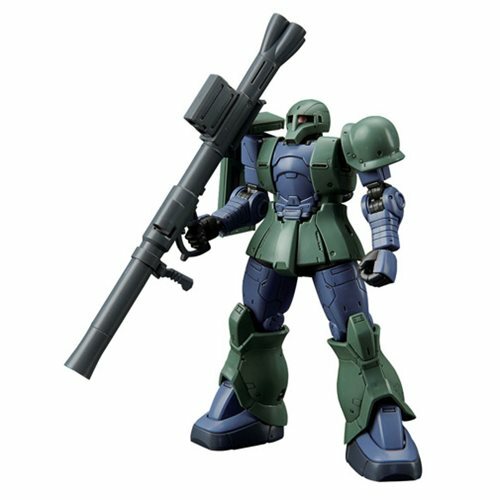 Weapons include large anti-ship rifle, bazooka with interchangeable cartridges, Zaku machine gun, and heat hawk in sheathed and battle-ready forms. Weapons can be mounted on the body through various hardpoints! Comes with 9 runners, a sticker sheet, and an instruction manual. Measures approximately 5-inches tall when complete. Ages 15 and up.